Nutrition is the process of consuming food and having the body use it as raw materials for growth, fuel, and function. But there are various parts that comprise overall nutrition, including actual nutrients, reasons to eat healthy, ways to eat smart, and much more. The foods you eat provide the energy your body needs to work. Just like you need to put fuel in your car or recharge your cell phone battery, your body needs to be fed food that provides it with energy every day. Glucose is the body's favorite form of energy. Carbohydrates are broken down into glucose as well as fructose and galactose units. If you don't get enough carbohydrates, your body can make glucose from protein through a process called gluconeogenesis. If you consume too many carbohydrates, your body will convert them into fat, and then used for storage in your adipose tissue. Protein comes from foods you eat and is broken down into individual amino acids. The body uses these amino acids to build and repair the various parts of itself. Also, muscles contain lots of protein which needs to be replenished through diet. The body even uses protein towards its immune system, hormones, nervous system, and organs. In terms of fats, the body needs them and needs them to be of the healthy variety. Not only are fats required to signal hormones, but membranes that contain fats surround all the cells of the body. Even the brain has fatty acids. Many B-complex vitamins help burn carbohydrates for energy. Vitamin A is needed for vision. Zinc is involved in many metabolic processes. Vitamin C helps to keep connective tissue strong and the immune system functioning. Vitamin D is essential for proper calcium uptake. Speaking of calcium, it's probably the best known dietary mineral. It has several functions in the body. But the reason you hear or read about calcium so much is that lots of it are stored in your bones and teeth. Therefore, you need it from your diet to keep your bones and teeth strong. Another mineral you've probably heard a lot about is iron. Although you don't need as much iron as calcium, it's essential for your cells to get enough oxygen. Your diet needs to provide adequate amounts of all of these "little helpers." And a healthy, balanced diet will give you lots of vitamin and minerals. An unhealthy diet may make the body deficient in one or more of them. Good nutrition provides more than energy, structural components, vitamins, and minerals. Antioxidants help protect the body from damage that comes from the sun, pollution, smoke, and poor dietary choices. They are the phytochemicals in fruits and vegetables (responsible for the bright colors). Some vitamins and amino acids even function as antioxidants as well. Phytochemicals are antioxidants found in plant-based foods. Although they aren't required for body function, they may have a very powerful impact on your health. For example, quercetin (found in red apples) operates like an antihistamine and has an anti-inflammatory effect. A healthy diet will give your body the right amount of energy, enough raw materials, and all the "little helpers" you need to stay healthy. Good nutrition will also provide phytochemicals and antioxidants that will help keep you feeling young, looking great, and perhaps even disease-free. 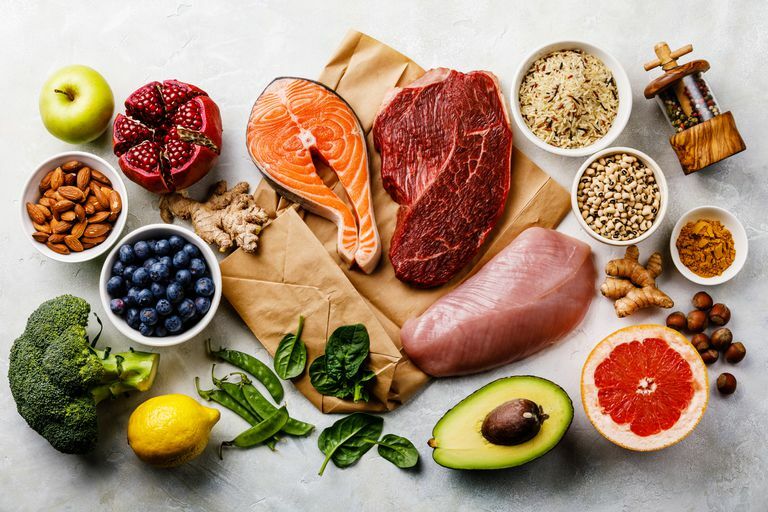 Essentially, a healthy diet includes lots of fruits and vegetables, some whole grains, high-quality protein, enough dairy or other calcium sources, and a bit of healthy fat. And while you don't want to deny yourself a few treats and the foods you love, it's best to cut back on unhealthy foods that are high in sugar, fat, sodium, and calories. That's where portion control comes in handy. Eating right looks easy enough on paper (or on a computer screen). But if you haven't been doing it for some time, it can be difficult to get back on track. The dietary supplement industry is big business and you can find supplements that claim to do a lot of things. However, the use of dietary supplements can ensure you get all the vitamins and minerals you need every day—most any multivitamin will accomplish that. But, as long as you eat a balanced diet you shouldn't need to take any supplements. And about those claims. Despite what you see on the labels, there isn't always scientific evidence to back them up. While there are times when taking supplements is supported by evidence, it's always best to speak with your health care provider before taking them, especially if you have any health issues.